These 3″ x 3″ square ceramic name cards come in a set of four and are a great way to indicate seating arrangements. 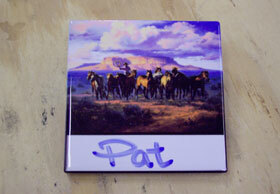 Use dry-erase markers for re-use or have the name printed on the tile as a memento of the occasion. Great for dinner parties, formal wedding receptions and even business meetings!